Football Park is the home ground of the Adelaide Football Club and the Port Adelaide Football Club. It was purpose designed for football and has a beautiful surface, lighting and stands. It has a capacity of approximately 48,500. 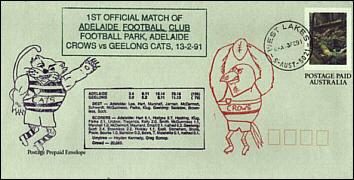 It is used by the Crows, Port Adelaide, SANFL teams and for interstate Football. The grounds dimensions are 170m x 135m. 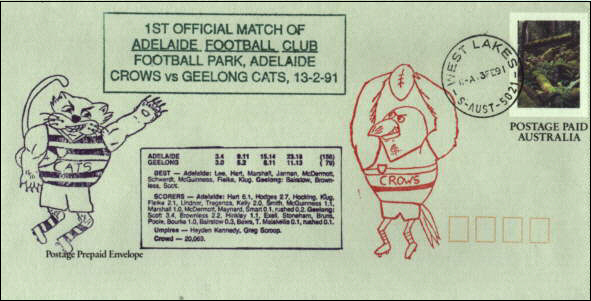 Its record attendance is 48,522 in 1993. 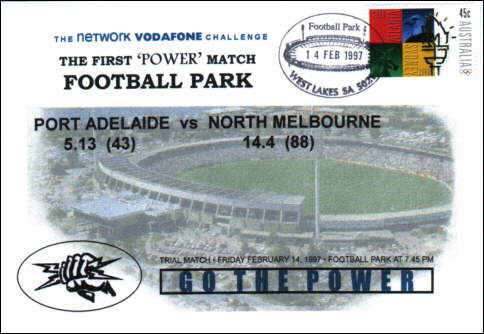 The postmark (PMP 565) was issued on the 13th January 1995 and was used on the FDI with purple ink. 89 covers were cancelled. 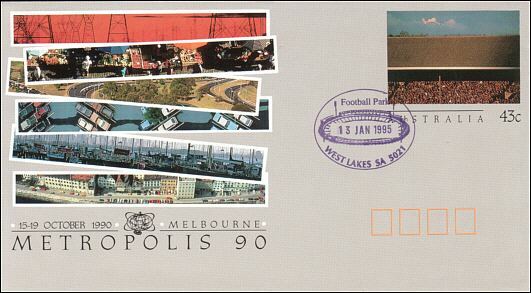 One cover was the 1990 Melbourne Metropolis Cover with a MCG Stand as the 43c Stamp. 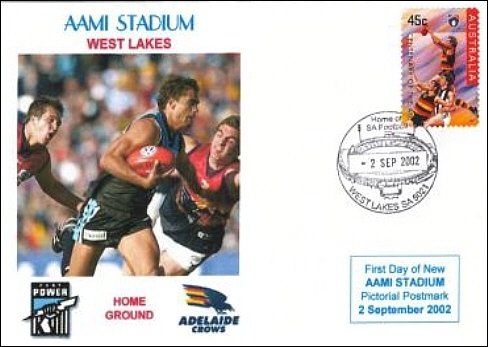 The first Adelaide Crows match at Football Park was commemorated by an overprinted Postage Prepaid Envelope (PPE). A PPE differs from a PSE (Pre-Stamped Envelope) in that it has no value on the stamp area. They are valid for use without additional postage even if the postal rate changes in the future. Above is printed the original PPE. It was modified in 1997 with better graphics. 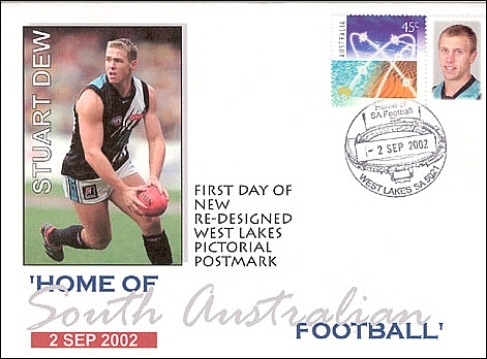 The first Port Adelaide match at Football Park was commemorated by a specially designed cover by Havilah Enterprises of which only 50 were produced. 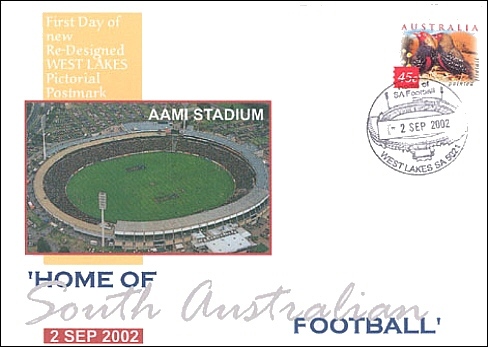 In 2002 Football Park changed its name to AAMI Stadium "The home of SA Football". A Commemorative Cover was released by Coversplease on 2nd September 2002. 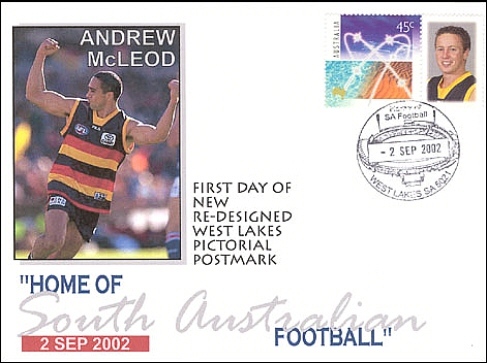 First Class Collectables released three covers showing Football Park, Stuart Dew and Andrew McLeod.